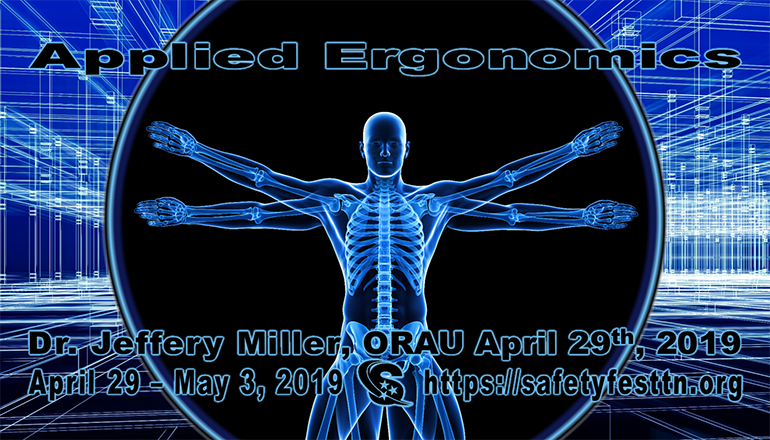 Monday, April 29, 2019 10:30 am, Jeffrey Miller, PhD, CIH, CSP, Oak Ridge Associated Universities (ORAU), will present Applied Ergonomics for Plant Design. All classes, sessions, and demonstrations at Safety Fest TN are free but registration is required to ensure there is enough space. More info below. This one-hour course is intended for health and safety professionals seeking a basic understanding of ergonomics as it applies to the design of manufacturing facilities. The fundamentals of ergonomic design for people at work will be briefly reviewed and resources provided for those seeking more detailed information. Ergonomic design criteria for engineers, architects, and designers will be discussed. Participants will be provided with resources to aid in the ergonomic analysis of engineering designs. Widely available ergonomics analysis tools will be compared and contrasted. Examples of how to apply analytical tools will be provided. Common issues related to ergonomic design will be identified and discussed. Dr. Jeffrey Miller is a Senior Scientist with Oak Ridge Associated Universities (ORAU), a non-profit consortium of more than 120 doctoral granting universities. He is ORAU’s program manager for safety and security culture studies in the nuclear industry. He also conducts occupational exposure and worker health studies, primarily of workers in the U.S. Department of Energy enterprise. He has a broad range of experience including 10 years with state and local public health agencies and 25 years working for private sector firms providing environment, safety, and health services to corporations and government agencies. He has been a field industrial hygienist, epidemiologist, project manager, entrepreneur, and executive. He helped start three companies and served for 10 years as Chief Executive Officer of those companies. He has a B.S. in Health Sciences from Western Illinois University, an M.S.P.H. from the University of Colorado, School of Public Health, and a Ph.D. in Public Health from the University of Tennessee. He is a Certified Industrial Hygienist® and a Certified Safety Professional® and is Past-Chair of the American Board of Industrial Hygiene. He is a member of the American Industrial Hygiene Association, American Conference of Governmental Industrial Hygienists, and the American Society of Safety Professionals.